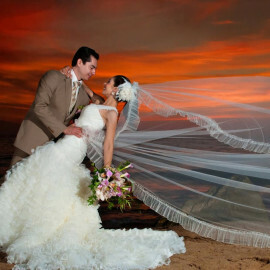 In Vallarta Wedding Planners we delight fulfilling their dreams and exceeding their expectations,, this has been our greatest reward. Por este medio reciban cordiales saludos de los que colaboramos en esta institución. 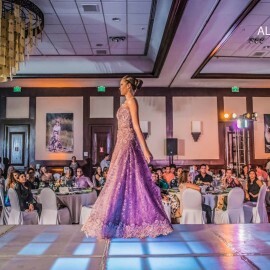 La presente tiene como fin, agradecerles todo el Esfuerzo y Cariño para con la Clínica de Rehabilitación, así como a todos los pacientes, que se verán beneficiados con el recurso recaudado el pasado 12 de Noviembre durante el “Fashion Show Marriott 2018”. Nuevamente gracias, quedo de ustedes. Clínica Rehabilitación Vallarta- Sta. 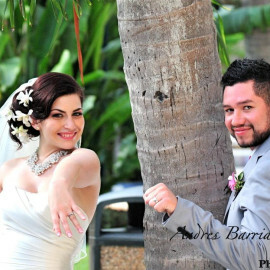 Barbará, A.C.
Abigail and her team exceeded my wedding expectations. 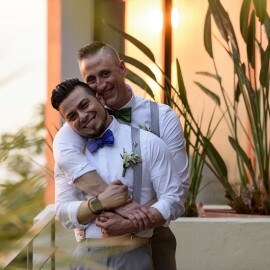 Our wedding was everything we wanted and more. Truly a fairytale! These women are professional, pay attention to detail, quick to respond and make you feel as if your wedding in top priority. 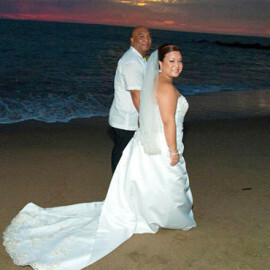 Anyone who is looking to get married in Puerto Vallarta, I strongly recommend their services. 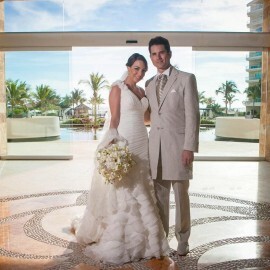 Lino and I want to Thank you from the Bottom of our Hearts, you and your staff made our dream wedding come true ! Everything was absolutely Gorgeous. I’m back in Chicago and everyone is still talking about what a Fabulous Wedding it was. 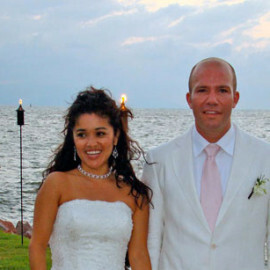 Paula you were not only my wedding planner but a true friend . Thank you for also keeping me calm and letting me know that everything was going to be just fine . You are the Best !!! Love You !!!! Honestly, words are NOT sufficient to describe how thankful, blessed, and grateful we are for YOU and your staff’s work in putting together what has been the best day of our lives. 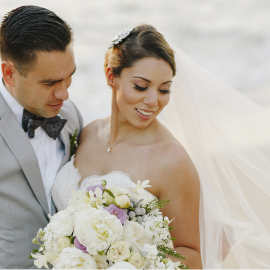 From the moment, we reached out to you until the day of the wedding and so forth, Paula you have beyond exceeded what it means to be a planner. Thank you for everything possible you did to make this bride and her GROOMzilla happy haha. 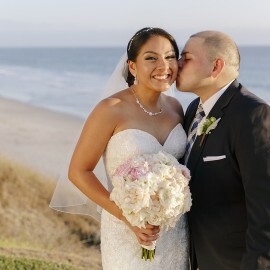 Every aspect of our wedding was BEAUTIFUL and AMAZING, from the decorations, to the flowers, the venue, just EVERYTHING was breathtaking… I did not want the day to end. 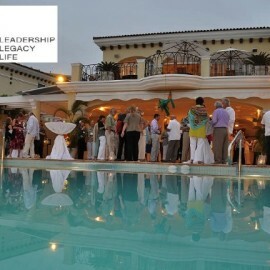 All of our guests had a lot of fun! 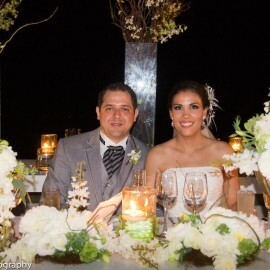 Our guests are calling our special day the “wedding of ALL weddings” or the “wedding of the century,” words are just not enough to express our appreciation to you and your staff. Most importantly, thank you for making the day stress-free and enjoyable for us! Just having you there was such a delight, because you made everything run so smoothly that I can only imagine what would have happened if you were not a part of it. Uriel and I got so lucky to have found the PLANNER of all PLANNERS. Everything was just so, PERFECT! 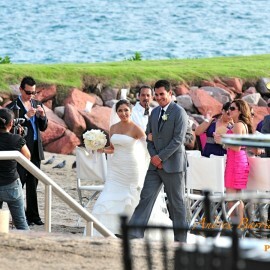 I wish that Uriel and I can get married again and live this unforgettable experience once again! But here we are…back to reality in the U.S. We will see you soon to share more wine from Napa Valley when we visit Vallarta! Haha…Cheers! Me gustaría agradecer a Paula y todo su equipo, son todos unos profesionales en todos los aspectos. Nos cumplió todos los gustos a Fátima y a mi. Todos los proveedores, desde los arreglos de flores a el Taquero que no se fue hasta que se termino la carne a las 4 de la mañana!!!!!! Nos dieron excelente servicio y atención y eso fue gracias a Paula y a su dedicación a que nosotros y todos nuestros invitados estuvieran felices. Cuando le pedíamos información a Paula sobre algo que queríamos para la boda, ella ya nos tenia precios, proveedores y consejos. También en cualquier lugar que nos podía ahorrar gastos innecesarios nos lo decía y muchas veces me tuvo que convencer de hacer las cosas de otra manera y te lo agradezco mucho por eso ahora. Desde el principio sentí que nos trataba de cuidar, como si fuéramos familia y voy a estar eternamente agradecido. 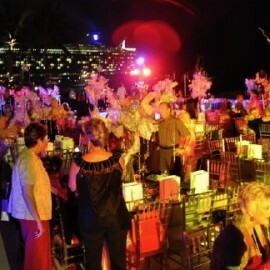 El Rehearsal Party fue una excelente idea de Paula!! 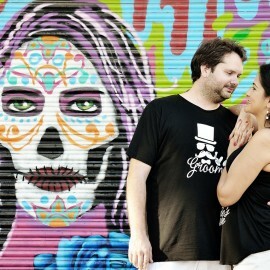 Súper divertido, nuestra boda no hubiera sido lo que fue, si no es por el jueves en la noche en Mandala Sky. 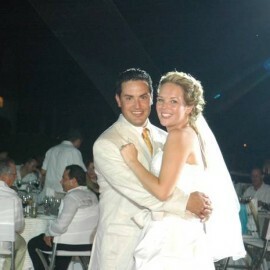 Club Regina fue el lugar perfecto para nuestra boda, Julia y todos los que trabajan en Regina nos trataron muy bien y jamás tuvimos algún problema. Jamás olvidaremos esta experiencia tan Hermosa. Ya extrañamos los emails y whatsapp de Paula diariamente jaja. Y ya queremos volver a Puerto Vallarta para visitarte y llevarte Buenos vinos tintos de Napa Valley, solo pídeme cuales quieres y con muchísimo gusto te los regalo. Para siempre vamos a estar agradecidos contigo. I would love once again to thank you, for all your hard work and planning. You made our day so special and elegant. On top of that you all so sweet caring. Esperamos que la este pasando bien! Muchísimas gracias por todo! 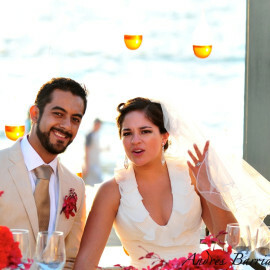 No imaginamos lo linda que seria la boda….bravo! Espero lo este pasando muy bien. Me encanto trabajar con usted. I knew that today was going to be the day that hit me the most. :( We are now back to reality and today I am back at work with my students. Can we please go back?!! We just wanted to thank you again for the AMAZING job you did with our “wedding of the century” (like most of our guests are calling it haha!). We couldn’t be happier with EVERYTHING! People have asked me how I chose the venue, how I came up with the flower arrangements and the whole setup, how I found the photographer, etc. My answer is always, “we did nothing other than tell her what we liked and BAM! 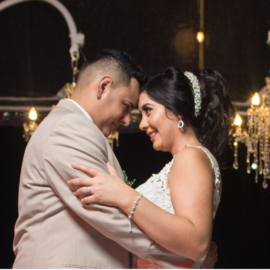 we showed up and she had it all ready!” Really, Pau, it was so beautiful and everything just ran so smoothly and it is all thanks to you and your staff. Thank you for making our day so special, stress-free and most importantly, enjoyable! Every single one of the guests had a fun, great time and they, like us, wish we could be back there reliving it once more. But for now, back to reality we go! 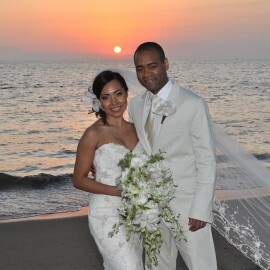 We hope to see you soon when we come vacation in Vallarta once again! 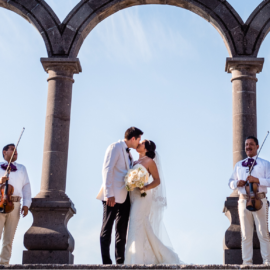 No tenemos como agradecerte lo suficiente por todo tu esfuerzo y dedicación para que el día de nuestra boda fuera mas que perfecto! Tu junto con tu equipo hicieron un excelente trabajo y sabemos que somos muy afortunados de haberte encontrado para ayudarnos a planear y coordinar todo! Les deseamos mucho éxito en todos los proyectos que siguen! Muchísimas gracias por todo !! Tus amigos Elena y Justin! 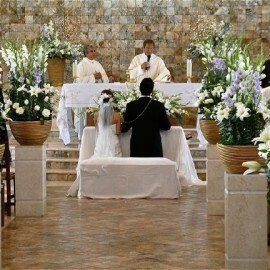 En el aeropuerto y realmente descansando yaaaa, te queremos agradecer el profesionalismo con que hiciste TODOOO ¡¡¡¡ Quedo la Boda Mejor de lo que pensábamos, realmente supero las expectativas y la boda de hace 8 años! 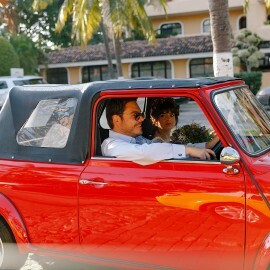 Woowww Felices ….lo que le sigue !! Muchísimas Gracias por todo tu empeño!!!! Un millón de gracias por hacer de nuestra boda, sin duda; el mas bello día de nuestra vida! Cada detalle fue perfectamente bien organizado. 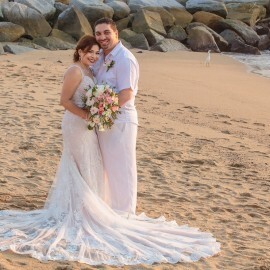 Para nosotros fue un placer recibir nuestra familia y amigos de Suiza y Guadalajara, sin ningún estress, en Puerto Vallarta, durante dos semanas. 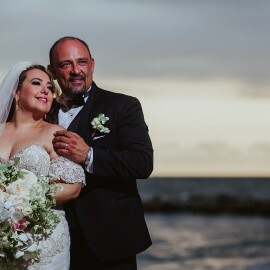 Los 4 eventos que fueron; el Cocktail de bienvenida en el Manadala Sky, la boda en el hotel Club Regina, el día pasado en el Don Pedro’s en la playa de Sayulita y la cena de despedida en el Coco Tropical, todo fue una maravilla para nosotros y nuestros invitados: Todos dijeron que fue la mas bella boda que hayan visto en su vida! Un abrazo muy fuerte desde Suiza! Pronto nos volveremos a ver estamos seguros, en Puerto Vallarta o cuando vengas a Europa! Abigail, thank you very much! 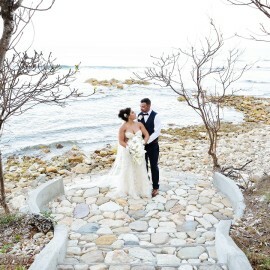 Our wedding was so beautiful! 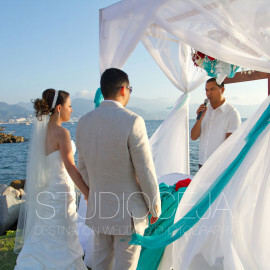 Si, quedo lindísima nuestra boda. Les encanto a todos los invitados. Varios me pidieron su información. 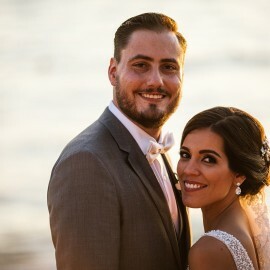 Solo podemos darte las gracias por tu dedicación y entusiasmo en preparar nuestra boda (y el buen rollo y eficiencia en skypes, mails, visitas, etc.). Has sido la perfecta directora de orquesta: no sólo en llevar a cabo todas nuestras ideas locas y diferentes, sino también solventando los detalles de última hora (de donde salieron los rusos blancos?). Pero sobre todo, te damos las gracias por el increíble resultado: la realidad superó nuestras expectativas y permitiste que nos centráramos en disfrutar de nosotros y de los nuestros en nuestro día. But above all, we must thank you for the wonderful result: reality exceeded our expectations while you allowed us to focus on having fun with ourselves and our attendees during our big day. 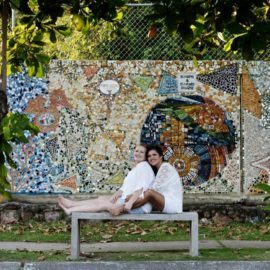 Recuerdo mi primer email que te mande y te pregunte si habías hecho una boda igualitaria. Me dijiste que no pero que te encantaría. 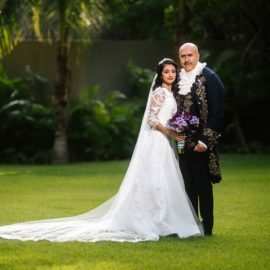 Te ganaste nuestra confianza en nuestro primer skype y hace una semana hiciste la boda de nuestros sueños una realidad. Aún no lo puedo creer. Realmente fue un labor de amor de todas partes. Me sigo despertando con una sonrisa sabiendo que todo salió perfecto. Como te dije, realmente tienes un gran talento para esto y te luces. Recibimos tantos comentarios sobre la excelente atención a detalle. 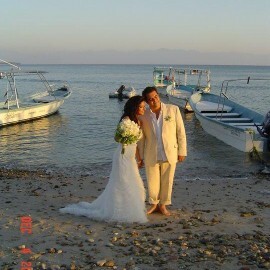 Muchos honestamente diciendo que fue la mejor boda de su vida! Nos vamos de Puerto Vallarta hoy pero te quedas con parte de nuestro corazón. Te apreciamos tanto y con todo el amor del mundo te decimos que tienes tu casa en Chicago. Un gran abrazo y beso! I remember the Firts email I sent you, and I Asked if you had ever done a same Gender Wedding, and you said No, but i would love to. 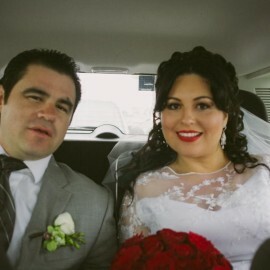 You won our trust and confidence on our Firts Skype, and a week ago you made the wedding of our Dreams a reality. I still can´t believe it. It was really a Labour of Love on all aspects. I am still waking up with a smile on my Face, knowing that everything turned out perfect. 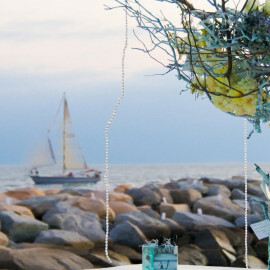 We are now leaving Puerto Vallarta today, but we leave you part of our Heart. We appreciate you so much, and with all the love in the world, we say, You Have a Home in Chicago. It feels like such a long time since we’ve chatted! Thank you again so much for all of your great work on January 2nd! It was a perfect evening for Kevin and I! 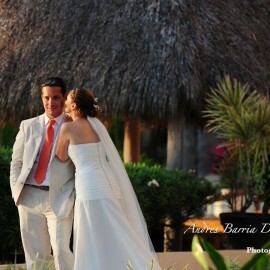 Thank you for everything, you did to make our Wedding so beautiful and so memorable. We could no have done it had so well without you. 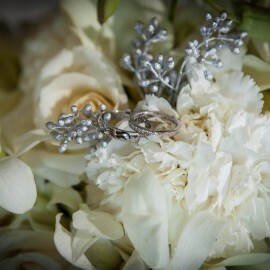 The Flowers were Stunning ¡¡¡ How did you do that ? Hector was Great, The ceremonial area was Gorgeous, The dinner area was both tasteful and luxurious, and the DJ seemed to know exactly what worked. First and foremost, let me please thank you, one last time, for a job well done, you took our vision and made it grander SO Great Job!!! Te quería mandar este mail para agradecerte con todo mi corazón el trabajo increíble que hiciste. Desde el momento en que te contactamos, nos diste una tranquilidad que no teníamos antes. Sentí que me podía relajar y empezar a divertirme planeando la boda. Tu trabajo fue siempre impecable y súper profesional. Tu apoyo fue inestimable. Muchísimas gracias por tu increíble trabajo y tu impresionante sentido de organización. 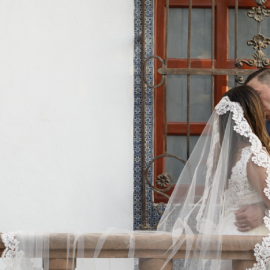 Sin ti, nuestra boda no hubiera sido de verdad perfecta. Ya me entere también de que estarás planeado la boda de mi hermana! Me da mucho gusto porque se que le vas a brindar el apoyo que necesita y que no se encuentra tan fácil en muchos wedding planners. Y me da mucho gusto también porque te volveré a ver otra ves en Noviembre! Te puedo pedir un ultimo favor? Me podrías mandar el mail de Tony y del DJ (no me acuerdo de su nombre), el de Fran, y el de Bryan para agradecerles su trabajo increíble también? De verdad tienes un grupo de personas muy talentosas trabajado contigo. Muchas gracias por todo otra ves Paula, fuiste de verdad un ángel traído del cielo!! Nos vemos pronto! Primero que nada quiero agradecerte por haber hecho de mi sueño una realidad. Desde el momento que te contacte pude percibir la capacidad que tienes como organizadora de eventos. 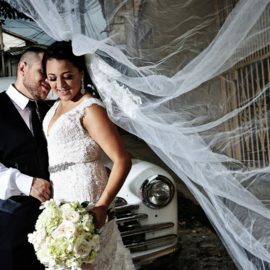 Paso a paso me fuiste guiando en base a lo que yo necesitaba, tu atención en cada detalle hizo que mi boda transcurriera de una manera impecable y perfecta. Durante 8 meses estuviste contestando a mis peticiones sin ninguna demora. No hay palabras para agradecerte el trabajo tan increíble que hiciste. Algunas personas preguntaban porque no estaba nerviosa el día de mi boda y la única razón era porque “tu tenias todo bajo control”. Fue increíble trabajar contigo, tu y tus proveedores son excelentes. 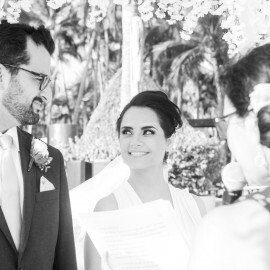 Muchos de mis invitados dijeron que era la boda mas bonita y divertida a la que habían asistido. 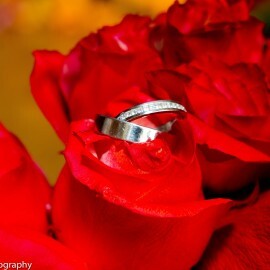 I’m sorry it has taken such a long time to thank you for the amazing work you did in planning and throwing our wedding! 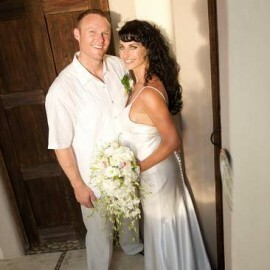 First, tom and i had such an beautiful and unforgettable day. Every single thing about the day was perfect for us. Although we were a bit stressed before (dealing with family and wedding jitters) the day was perfecto! Also, our families and friends had an amazing time. Everyone said it was the best wedding they had ever been too. There was a bit of tender emotion and a lot of fun times! I hope you are all well and enjoying some relaxation now that it is rainy season. Many thanks to Paula as well! Aqui todo bien. Yael y Joe en su nueva casa y si efectivamnete ya tienen el video pero creo que no lo han visto ya que se siguen deleitando con sus recuerdos. Reitero la maravillosa experiencia que tuvimos trabajando contigo. 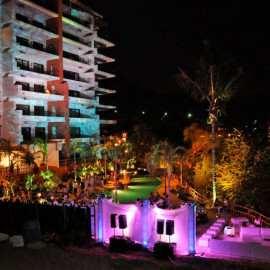 Por este medio queremos agradecerles por apoyarnos en la produccion y realizacion de nuestra Cena-Baile de Becas Vallarta, A.C. que gracias al esfuerzo y trabajo de gente como ustedes fue todo un éxito. en las vidas de generaciones venideras. Muchísimas gracias por su generosidad para ayudar a los jóvenes Vallartenses. Presidente Becas Vallarta, A. C.
Ya estamos en Hong Kong y queremos darles las gracias por todo, quedo increible, padrisimo y perfecto todo!!! les hablo cuando llegue. Les mandamos miles de besos.